The first Downloadable expansion for Destiny is coming December 9th, as detailed on the Destiny blog. It will be available on all platforms, with exclusive content for Sony players. 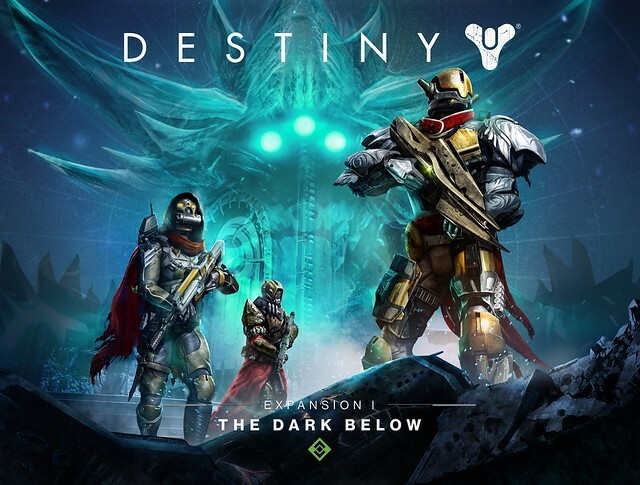 Titled 'The Dark Below', the expansion raises the level cap to 32, which brings with it the ability to use new weapons and accessories, as well as new Crucible maps to challenge other players on. "Your legend grows. Reach new heights of prestige and glory by increasing your Light Level to 32, acquiring exclusive new weapons, armor and gear, and facing new cooperative and competitive challenges as your adventure continues. After years hiding amongst the Hive shadows, a new character, Eris, has come forth bearing an ominous warning: The Hive seek to summon a god, Crota, to destroy the Earth. Find her in the Tower to complete her quests and three new story missions, increase your Light, and earn the weapons and armor you’ll need to face what waits in the dark below. Summon your courage, Guardians. Crota waits in the dark below. Gather your most trusted allies to form a Fireteam, six Guardians strong. Don your best, battle-hardened weapons and armor. Master the depths of the Hellmouth. Face Crota, and live, and glory and reward are yours for the taking." When it releases in about a month, the expansion will cost $19.99 if purchased for non-season pass holders.